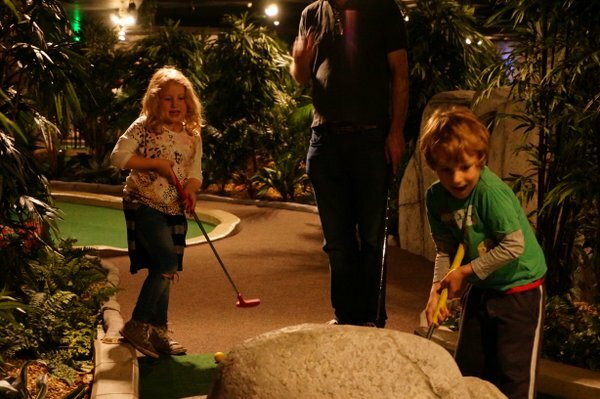 Last week we got to try The Lost City Adventure Golf in Nottingham’s Corner House. You can play either 18 or 36 holes indoors in the fabulous exotic Incas themed course. This is a great concept with appeal to a wide range of groups – families, stag and hen dos, corporate groups, couples, teens and those wanting something a bit more active to do in the city centre. They also have lots of Easter treats in store. It makes golf accessible, easy and most of all lots of fun. It gives groups of grown ups a a fun alternative to bars and teenagers something to do – we followed two young girls round the course, they were having a real giggle. For families it is somewhere to go when it rains, or in our case something active to do after a trip to the cinema! We loved the Aztec theme, it really feels like you have journeyed somewhere exotic and the musical landscapes, talking statues and moving walls really fed the children’s imaginations. It is like being a real life Indiana Jones. 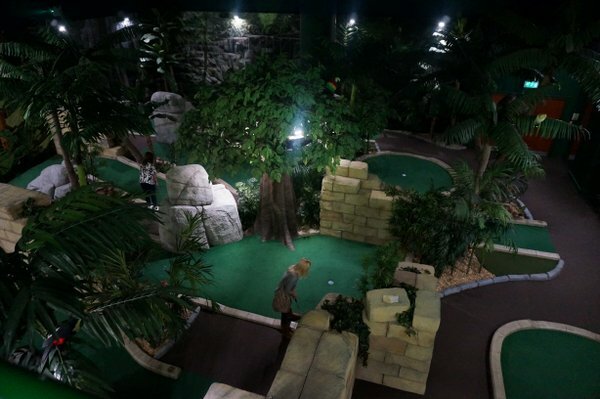 Adventure golf is more challenging than your average crazy golf course, you can see in this picture the course is high quality and has lots of gentle slopes to navigate. Mr G (5) hasn’t learnt to resist putting other people’s balls into the holes…we are working on it though. He loved the course, even if we cut his antics shy of 18 holes for really annoying his big sister. Miss L (7) got right into the swing of it (sorry) she was keen to keep scores and follow the rules, and really proud of her achievements. Mr G having some ‘time out’ gave Mr A a chance to chat to owner Lane Scott, ‘Nottingham businessman to businessman’, in the bar. The venture has been a long time coming together, with a million pound investment from Lane, but he is clearly onto a winner. The course is excellent quality, this is a prime spot in the city centre and the first adventure golf course in the East Midlands. Adventure golf is a fast growing sport, but with only 7 other courses existing around the country. The mezzanine is soon to be further extended to cope with demand for children’s birthday parties and other events. While we were there a group of children dressed as superheros were tackling the course and tucking into party food after. The Lost City is in the basement of the Cornerhouse in Nottingham. For more information and to stay up to date with the latest news and offers visit www.lostcityadventuregolf.com, like www.facebook.com/lostcitynotts or follow @lostcitynotts on Twitter. I used to love crazy golf! Not done it for years!!! Looks like great fun here. Me too! I was trying to remind myself how much I used to cheat! I had no idea we had crazy golf in Nottingham! We had a great game of crazy golf in Ambleside this week in the sunshine. We all had a good time. I won’t tell you my scores! Or that at the end you have to pot into a statue and it talks – it told me I was a loser! Wow that looks like a lot of fun. You have so much cool stuff going on in Nottingham! Nottingham is ace for kids! And we love the look of Legoland Mich! Looks like heaps of fun Penny! This looks lots of fun. We tried crazy golf before christmas and the girls loved it, although they started cheating after about the third hole! This looks brilliant – I had no idea it was there! Sophie is perhaps a little young at the moment, but it’s great to have something a bit different and I know Michael would love it!